The Dominicans are first recorded in Spoleto in 1235, when the Blessed James of Bevagna joined their community. 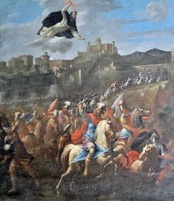 This was only a year after Pope Gregory IX had canonised St Domenic at Rieti: the Bull of canonisation had been issued from Spoleto. When the future St Peter Martyr preached in the city in 1245, he stayed with the friars and exhorted the citizens to establish a convent for them. In 1248, the papal legate, Raniero Capocci afforded them protection and arranged for them to be given a small church on this site. Traces of this church, which was dedicated to San Salvatore and belonged to San Pietro in Valle, remain under the present campanile. Work on the present church began in 1251, the year in which the Dominican Fra. 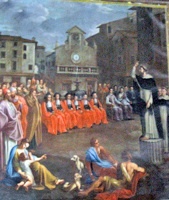 Orlandino preached in Spoleto in an attempt to bring peace to the city. Pope Alexander VI granted indulgences for those visiting it on the feasts of St Dominic and St Peter Martyr. The Dominican Bishop Paperonus De Paperonis (1285-90) probably encouraged the work on the church and convent, which was probably complete by the meeting of the Provincial Chapter that was held here in 1291. The interior of the church was re-modeled in the Baroque style, presumably before its re-consecration by Bishop Lorenzo Castrucci in 1634. Much of the convent was taken from the friars during the French occupation in 1789 and was subsequently used for various educational activities. The Dominicans were finally expelled in 1915 and the church passed to the Franciscans. It was restored in 1934-7 by Ugo Tarchi. The church is now dedicated as SS Domenico e Francisco and is once more in the hands of the Dominicans. The church was faced with alternating bands of red and white marble. The present façade dates to the late 14th century, when the nave was extended by some 6 meters. It is possible that its rose window was never completed. The Gothic portal on the right wall (illustrated above) has a damaged fresco (16th century) of Christ by Pierino Cesarei in the lunette. The church has a fine rectangular apse with stained glass windows. ✴The upper section of the campanile also dates to the 16th century. ✴The chapels to the sides of the apse were added in the 17th century. The programme of restoration of 1934-7 removed the Baroque decorations and revealed many of the original features, including a number of frescoes (14th and 15th centuries). This fresco in the tabernacle above the water stoup, to the left of the entrance, has been heavily repainted. 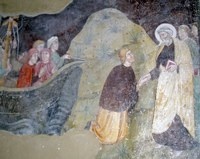 This fresco is to the left of the Cappella di San Pietro Martire. Christ flies down to give the Host to St Catherine while two angels (one of which has been lost) hold a crown above her head. The stigmata on her right hand is clearly visible. The fresco was probably commissioned soon after the canonisation of St Catherine in 1461. It is usually attributed to Bartolomeo da Miranda, although Filippo Todini has rejected this and designated it as the autograph work of the Maestro del Trittico di Sant’ Eufemia. The paintings reproduced here show interesting images of Piazza del Mercato (before the present Fonte di Piazza was built) and Ponte delle Torri. 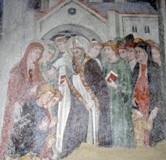 This fresco to the right of the Cappella di San Pietro Martire has been heavily repainted. It is nevertheless of high quality. This panel, which is attributed to the Maestro di Fossa, is in the chapel that is reached by the door on the left wall of the transept (which is used for evening services). It was probably originally part of a polyptych. St Peter is shown against a gold background with a dagger in his shoulder while two angels hold a crown of martyrdom above his head. A small figure in the Dominican habit kneels to the right. Nicolò Benedetti di Montevecchio (died 1638) built this chapel, which houses his funerary monument on the right wall. The stucco decoration (1669) is signed as the work of Giovanni Fontana da Foligno. The steps on the left of this chapel lead to the ex-church of San Pietro Martire, which originally had its own entrance. The gold-plated reliquary on the altar contains another of silver. Both reliquaries are the work of the Roman goldsmith Ludovico Barchi. The silver reliquary contains a relic known as the Sacro Chiodo (a nail that had been used in the Crucifixion of Christ and recovered by St Helena in the 4th century). According to tradition, the Blessed Gregory of Spoleto acquired this relic in the 15th century. The silver reliquary is exposed for worship each year on Good Friday and on 3rd May. •St Helena, the mother of the Emperor Constantine, throwing the sacred nail into the Adriatic to still a terrible storm that threatened to wreck the ship on which she returned to Italy from Jerusalem. This altarpiece on the left wall is attributed to Cesare Nebbia. The Gothic windows in the apse were restored and their stained glass installed as part of the restoration of 1934-7. 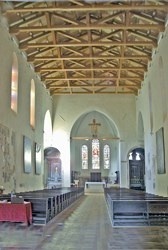 This fine painted wooden Crucifix is above the high altar. A tiny figure of St Dominic (difficult to see) kneels at the foot of the cross. •the Madonna del Latte flanked by two female saints. This chapel is to the right of the apse. This lovely fresco is on the barrel vault. This fresco is on the back wall. Among the many witnesses, St Mary Magdalene kneels at the foot of the cross. ✴the "Noli me tangere" (illustrated), when the Risen Christ appeared to St Mary Magdalene but would not allow her to touch Him. ✴St Mary Magdalene preaching in the city (in the upper register of the right wall). In this story from the "Golden Legend", St Mary Magdalene converted the Governor of Marseille and he then went on a pilgrimage to Rome. His wife died on the way and her grieving husband buried her on an island before continuing to Rome. There, St Peter told him to trust in God, and on his return journey, he duly found his wife alive in the place that he had left her body. When they arrived in Marseille, St Maximinus baptised them. The cycle begins in the upper register of the right wall and then continues in the lower register of both walls. This altarpiece, which is signed by Giovanni Lanfranco, on the altar (1630) on the back wall of the transept. This altar belonged to the Sansi family. The main panel depicts the Madonna and Child in glory with St Anne and (below) SS Catherine of Siena, Catherine of Alexandria and Helen. The latter holds a large cross that the baby Jesus reaches towards. The smaller upper panel, which depicts God the Father, is probably a workshop production. This fresco is in a niche on the right wall of the transept. ✴the Madonna in glory with SS Hyacinth and Brictius. This panel, which is attributed to Giuseppe Cesari, the Cavalier d' Arpino was originally on an altar in the left aisle that was demolished in 1934. It is a copy of the Transfigration (1516) by Raphael, which is now in the Pinacoteca Vaticana, Rome. This fresco is on the first altar on the right. An interesting group of bishops, religious and lay people engage in an animated discussion below. Return to Monuments of Spoleto.